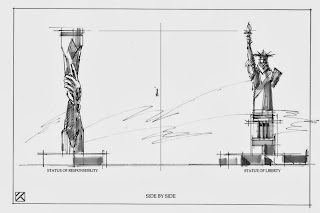 HONEY AND HEMLOCK: The Proposed "Statue of Responsibility"
The Proposed "Statue of Responsibility"
We all know the famous line of Eleanor Roosevelt: "With freedom comes responsibility". However, in public forums we hear a lot of talk these days about freedom, but not much about the responsibility that comes with it. Rather, when responsibility is brought into the discourse, it is usually taken to be more of an infringement on one's rights than a companion of freedom. "Freedom, however, is not the last word. Freedom is only part of the story and half of the truth. Freedom is but the negative aspect of the whole phenomenon whose positive aspect is responsibleness. In fact, freedom is in danger of degenerating into mere arbitrariness unless it is lived in terms of responsibleness. That is why I recommend that the Statue of Liberty on the East Coast be supplemented by a Statue of Responsibility on the West Coast." 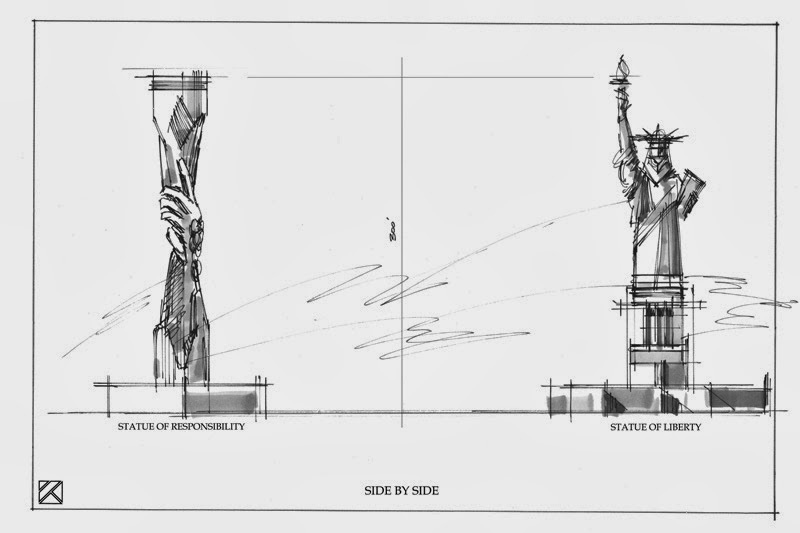 When I read this I thought how interesting it would be if someone actually proposed this idea before the United States Government, to have a Statue of Responsibility stand as a book end on the West Coast to the already famous Statue of Liberty on the East Coast. Then I did a Google search, and I was shocked. It appears this idea has been proposed and seriously been taken into consideration for a few years now, and not only do they have a rendering of the proposed statue set, but money is being raised for it to be constructed and to take shape off the shores of a major West Coast city. If you don't believe me, do a Google search yourself. It certainly appears that the vision of Viktor Frankl will soon become a reality. Suffice it to say, I am a supporter of this project, and I hope it does come to fruition. I believe what it stands for is at the heart of the Declaration of Independence, as well as Rod Serling's warning as portrayed at the end of the film Planet of the Apes.